Contemporary industrial arrangements inspired by authentic New York lofts dating back to the 1950s. of the 20th century. The use of raw, existing surfaces and damaged, heavily worn-out equipment, which still can carry out their functions, is becoming fashionable again. Concrete, brick, metal, old wood, industrial lamps, huge glazing’s and uncovered windows – these are the main distinguishing features of the style. The metal lamp gives the interior a truly industrial climate. Tequila collection, Ceramika Paradyż. The characteristic feature of the loft spaces – both authentic and brand new “soft loft” investments – is a higher than above average height. High suspended ceilings give the space more breathing air and radically enlarges it. It also creates some challenges – e.g. related to interior lighting. Unfinished ceilings, often with visible structural elements, makes it necessary to use long hanging lamps – preferably made of cast iron, metal, or simply “naked” light bulbs on ordinary cables – to illuminate the usable space. Another distinguishing feature of industrial arrangements is the desire to preserve the space unobstructed by any type of access. There is no place for unnecessary furniture, equipment or trinkets. Only for what is really necessary. In the bathroom – a simple washbasin, mirror, necessary sanitary equipment, lighting and storage space. In an industrial interior, the most important factors are order and simplicity. The task of each object is simply to fulfil its purpose. Aesthetic issues are relegated to the background – at least it looks like it because “raw” functional furniture and appliances have their own, very distinct aesthetics, consistent with the rest elements of the style. Because functionality is the prime concern when it comes to industrial interiors, decorative accessories are either completely skipped or limited to the absolute minimum. You can say that “the fewer elements, the more beauty”. Are you ready for a visualisation of these rules? Here are some examples of present-day bathrooms in an industrial style that will make you fall in love with it! Cool shades of white, black and a whole range of shades of grey – it is the most distinctive colour palette for the industrial style. Minimalistic white and black bathroom, covered with tiles from the Tequila collection, fits into industrial style thanks to large window glazing’s, metal furniture, characteristic lighting and interesting linear tile structure. The elegance of a black and white industrial bathroom. White, black, structural lines and simple metal furniture. Tequila collection, Ceramika Paradyż. Shades of grey are the most distinctive colour palette for the industrial style. Grey roughness of raw concrete, grey of steel, grey of stone – cool and seemingly unfriendly – is a neutral background for a colourful life of people who value freedom and experiment with different kinds of creativity. Unusual space, not cluttered by equipment and decorations, allows your thoughts to mature, and create projects – to be carried out. Brick red, dark wood or subdued shades of yellow are sometimes used to soften the rough character of the interior. Visible pipes, grey ceramic tiles with a concrete look, black metal hangers and shelves under the washbasin. And on the wall with the wash basin – a street art motif, taken straight from the street of a big city. The only permanent, colourful element of the arrangement is a celadon metal lamp with adjustable arms and uncovered light bulbs. The whole is stark but very functional at the same time. Ermeo/Ermo tiles collection, Ceramika Paradyż. 3. Street art in a bathroom? Street art in a home bathroom? Contemporary industrial style can freely assimilate it. Basic, functional aesthetics fit the style’s features. The ability to apply a variety of graphics to different surfaces gives unlimited arrangement possibilities. Ermeo/Ermo collection, Ceramika Paradyż. 4. Industrial style in a blockhouse apartment? Yes! Even in a small blockhouse apartment, you can use an industrial arrangement. It is the idea, method of arrangement and fashionable accessories that count, not the size of the interior. White brick in the ceramic version will be an ideal solution for a bathroom in an industrial style. Muro Collection, Kwadro Ceramika. We cannot imagine the industrial style without a brick wall! The unfinished brick wall is typical for the style, but heavy brick can be replaced by lighter, ceramic version in a bright colour. White brick will not overwhelm even a tiny room. Comfortable wash basin on a black cabinet, metal ladder as both a shelf and hanger, large horizontal mirror surface that visually adds space – it is an idea for making a dream about your own loft come true, even in a small apartment. View of a white “brick” bathroom shows how to keep order and free space even on a small surface. Muro tile collection, Kwadro Ceramika. Another example shows a functional bathroom connected to a dressing room. The most noticeable feature is a multifunctional piece of furniture, acting as a cabinet under the washbasin, element of lighting and a frame for the mirror suspended on a hook. A combination of metal construction with wooden table top and technical lighting gives an industrial character to the whole interior. Tiles imitating natural warm wood, emphasize the cold metal. 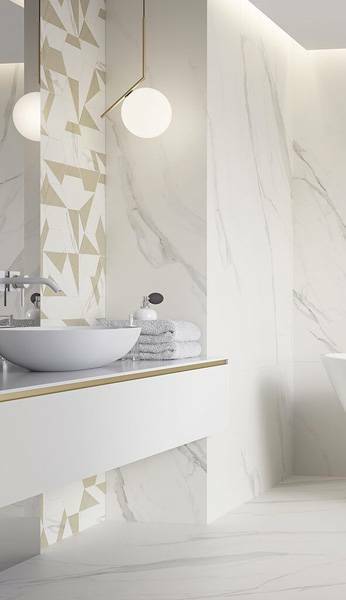 The only decorative accent of the room is the geometric structure of white tiles. The characteristic piece of furniture gives a distinct character to the whole room. Pandora tiles collection, Ceramika Paradyż. 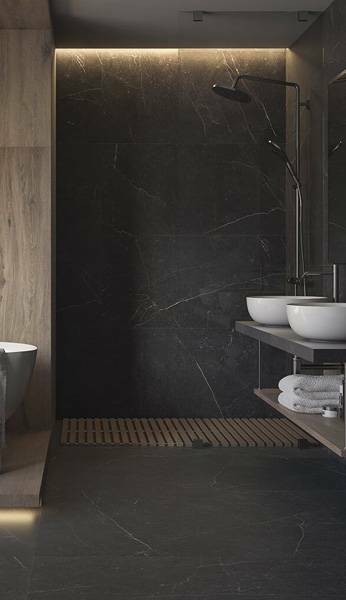 Large-format ceramic tiles with a raw concrete appearance help to maintain design coherence of a bathroom in an industrial style. 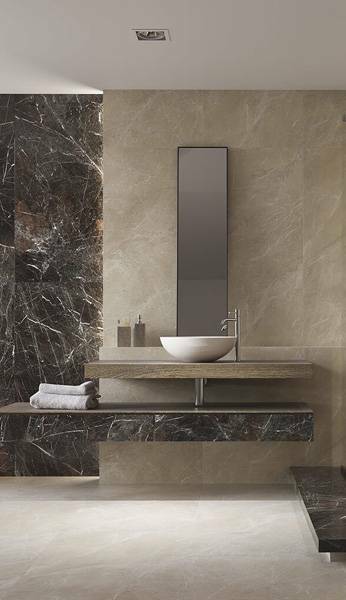 Light ashen large surfaces of walls perfectly match the black sanitary ceramics, the metal cabinet under the washbasin and the mirror in a steel frame. 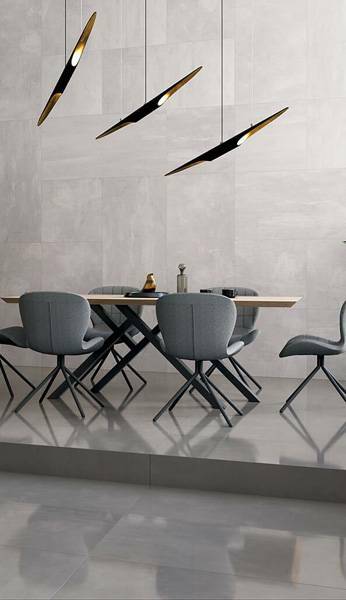 Hexagonal tiles in two shades of grey are an unusual decoration. “Naked” light bulbs on ordinary black cables are the cherry on top of a whole industrial arrangement. An industrial bathroom covered with “ceramic concrete” in the form of large-format tiles and hexagonal decors. Scratch Collection, Ceramika Paradyż. For the supporters of a slightly lighter, more delicate decor, we present a collection combining an industrial style with a fruit of labour of a textile manufacturer. Uncovered windows in black metal frames, concrete wash basin, light ashen floor and part of walls. But in the toilet zone – geometric plates imitating the appearance of the raw cotton canvas. This is a soft version of an industrial style, but not less characteristic. The roughness of the material, a distinguishing feature of an industrial style, also applies to fabrics. Natural linen pattern was used here Linum Stone collection, Ceramika Paradyż. Bathroom in an industrial apartment is to some extent an unusual place because it is a space clearly separated from the rest. Industrial interiors usually have the form of one, open, immense room, with functions marked only in a symbolic way – for example with a line of hanging lamps or a carpet (often in the same colour as the rest of the floor). If you are planning to create a coherent interior in an industrial style, it is important to carefully select each element of the arrangement – starting from the colours of walls and floors (preferably identical, so the space between horizontal and vertical surfaces would not be divided), through simple, functional furniture and a minimum number of accessories (authentic items “with history” would be best). You should not pay any less attention to the bathroom. An ideal solution is to maintain the consistency with the rest of the apartment – in terms of colour, functionality, dominant aesthetics and general feel. Industrial style, although very characteristic in its concrete grey functionality, leaves much room for creative experiments. And most importantly, it allows you to live in a sense of freedom and in harmony with the spirit of your own creativity. More inspirations for bathrooms in an industrial style can be found at www.paradyz.com.